Growing up in Muskegon, Michigan, Frank Piotrowski was captivated by the traditional music he heard at the Polish Hall, where his father organized dances for the community. Polka music originated in Bohemia in the early 19th century and became a ballroom dance craze across Europe, influencing musical styles across the globe. Since World War II, it has had a huge resurgence of popularity, particularly in immigrant communities in the American Midwest. Seeing Frank’s interest in this beloved style, his father arranged accordion lessons for him at age eight. However, his early teachers didn’t share his love of “the ethnic stuff,” so young Frank learned the traditional repertoire listening to records and observing the old masters who played at the Polish Hall; his sound was particularly influenced by Chicago greats like Eddie Blazonczyk. 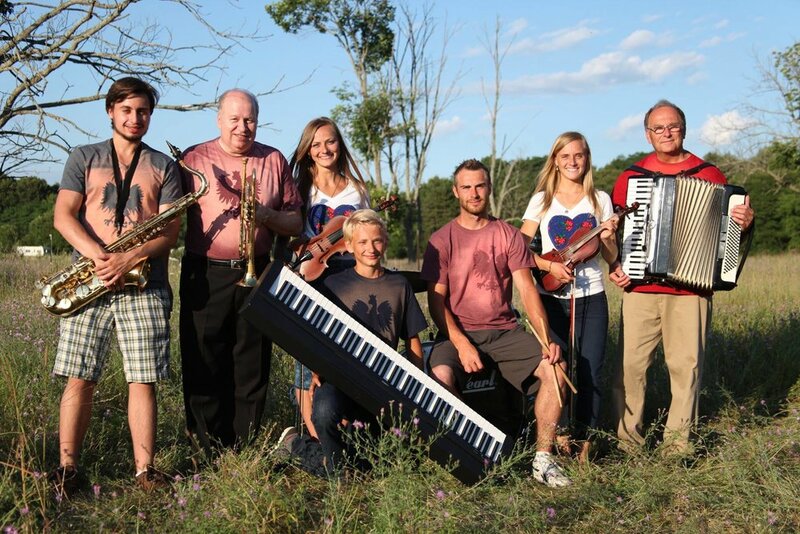 The Polka Towners launched while Frank was in his teens, after an audience member heard him play at the high school talent show and asked Frank to put together a band to play a wedding. Now the band is a family affair, which their name reflects. “Pan” is a Polish honorific much like “mister,” designating Frank’s central role in the ensemble. Zosia is his wife, a delightful singer who grew up in a close-knit family of 15 singing siblings in the small town of Brzesiny, Poland. They met in 1980 when Frank was touring Poland, and now the band includes their five children: Kristine and Andrea on twin fiddles, Kristopher on drums, Erika on vocals and fiddle, and their youngest, Simon Peter, on soprano sax and piano. The only non-family member is their friend Larry Olsen (trumpet, guitar), who has been with the band for over 30 years. Recently their performances include members of a third generation: Kristine’s girls, including Aniela, age 8, on violin, and the sweet voices of Marzena and Hiacynta (6 and 4); and Andrea’s 2-year-old son John-Joseph on accordion. Two more grandkids born this year are sure to be joining them soon! In addition to touring throughout the Upper Midwest and performing at polka festivals nationally, the Polka Towners are known for the “folk mass,” their lovely liturgical services for Roman Catholic churches and polka lovers of all denominations. They also regularly lead pilgrimage tours to Poland, sharing their abiding love for their homeland’s culture and heritage. With their eye-catching traditional outfits, exceptional twin fiddles, and infectious enthusiasm for Polish music, Pan Franek, Zosia & the Polka Towners bring the best of polka to the Richmond Folk Festival.